This new stylish ice cream vehicle is one sweet ride. "The new BRICS ice cream van is not the typical box truck beckoning kids during the dog days of summer with corny music. “It has a really cool style, totally throwback,” says Kirstie Hayward, general manager of BRICS (short for Broad Ripple Ice Cream Station). Her team scoured the globe to find a ride with a unique look to become a mobile extension of their location on the Monon Trail. After a two-month search, they found the French-made 1971 Citroën in Ireland, where it had been used as a coffee stand, and christened it Petite Bête, French for “little beast.” The color of a Tiffany-blue box, the BRICS truck combines nostalgic charm and European flair with its bulbous headlights, corrugated side panels, and chrome details. The cheerful “beep” of its horn even sounds like it’s from another era. 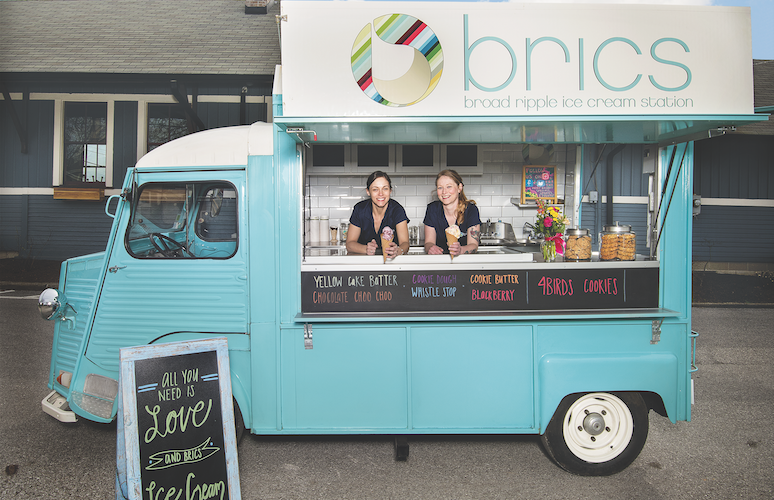 Look for the vintage wheels bearing BRICS’s ice cream at Ruoff Home Mortgage Music Center this summer."